A daily multivitamin should not cause severe body reactions, although you may experience mild reactions. Vitamin supplements are taken to maintain the proper levels of vitamins and minerals in the body. Drugs.com warns that you should not take more than the recommended dose on the bottle to avoid adverse reactions. Some body reactions to vitamins may include common side effects, allergic reactions and skin reactions. Any side effects you experience after taking vitamins need to be reported to your doctor for further evaluation. According to MedlinePlus, the most common side effects of a vitamin are an upset stomach and a bad taste in the mouth. An upset stomach may cause nausea, diarrhea, cramping, bloating and vomiting. 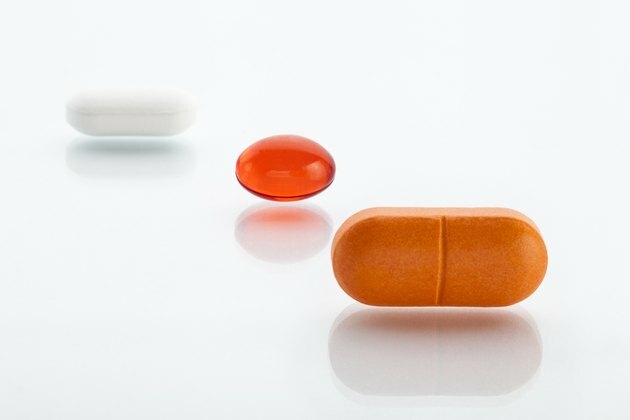 Drugs.com recommends taking vitamins with a full glass of water and with meals to prevent common side effects. If you develop more complex or concerning side effects, call your doctor. An allergic reaction to vitamins is rare but can occur. HealthTree states that a vitamin allergy will cause distinctive symptoms, such as nasal congestion, asthma, wheezing, shortness of breath, fatigue, headaches, itchiness, skin rashes and sniffling. An allergic reaction is a malfunction of the immune system that causes the body to build a defense against the vitamin. If you’re allergic to a certain vitamin, it is recommended to avoid consuming it. Skin reactions can form after taking vitamins. Skin reactions may be the result of an allergic reaction or an intolerance. The most common skin reactions from a vitamin allergy include hives, eczema and general inflammation in the skin, according to the American Academy of Allergy, Asthma and Immunology. Skin reactions will cause inflammation, irritation, swelling and redness on the skin. You may experience minor to severe burning or itching. If you suspect the reaction to taking the vitamin is related to an allergy, talk to your doctor about using an antihistamine. Antihistamines restrict the body from producing histamine, alleviating minor allergy symptoms, such as hives, sneezing and watery eyes. Skin reactions can be treated with topical steroid creams, such as hydrocortisone cream, according to the American Academy of Allergy, Asthma and Immunology. Drugs.com warns that taking vitamins risks anaphylactic shock, a rare all-body allergic reaction. If you experience lightheadedness, a rapid but faint pulse, mental confusion and constricted airways, call 911 immediately.